But nowadays, I get so excited to open up clothing gifts my family! I love the shape, pattern and neckline beading on this dress. It is perfect for summer days and nights. Don't forget today's link up theme is summer dresses. Share your favorite! 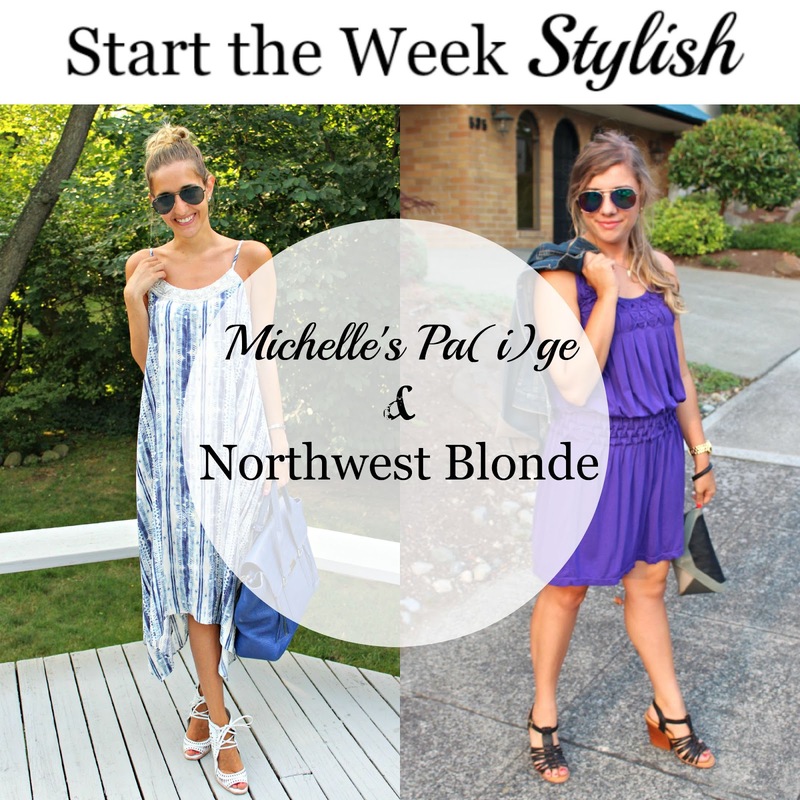 Meet our co-host for this week's Start The Week Stylish linkup: Rachel from Simply Rachel Nicole! Rachel is a lifestyle blogger who blogs about fashion, family, fitness & her journey as a mommy. She has a knack for fun braided 'dos & girly outfits, plus shares some of the cutest family photos we've ever seen! Be sure to stop by her blog this week and say hello! Love this blue & white outfit - that dress is so pretty! Thank you! I love wearing it since it was gift from my parents! What a fun dress! I love the blue bag and great shoes with it! Blue is the perfect color on you, wow!! I love the simple shape of this dress and the colour and patter are beautiful! Those heels are super cool too. Yes - I love the handkerchief style hem & the subtle tie dye print! such a beautiful dress and it looks great with those shoes! That is a perfect dress for a summer day in D.C. Love the color of the bag! What a great dress your parents picked out for you!! So summery and simple yet chic. I hope your week is as fabulous as you are looking today! I love your sunnies! You look gorgeous!! Congrats on being one of our favorites! I'm so glad you are enjoying the link up so far! What a pretty dress! Love the bag! Thank you so much for making me a favorite pick this week! I am absolutely loving that dress your parents picked out! I love the colors! Such a fun, summer dress! Great dress! It's a true gift that your family gets you and can shop for you.